This review essay has been printed in the August 2014 issue of Chess Life. A penultimate version of the review is reproduced here. My thanks to the good folks at Chess Life for allowing me to do so. Was Fischer serious? Probably not. 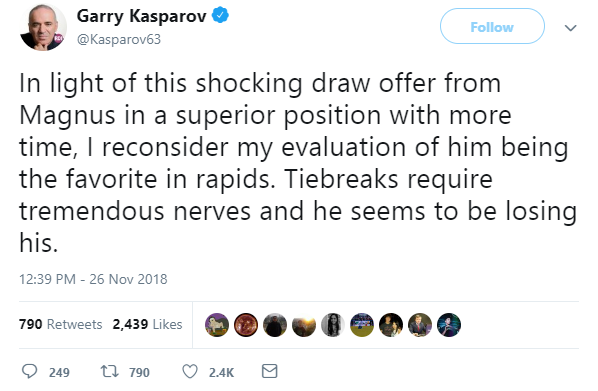 Still, the severity of his proposed methods makes clear the import he placed on the opening, on its study, and on the value of Modern Chess Openings in the pre-computer age. There is, of course, still a place for the one-volume encyclopedia in 21st Century chess, but today we have more options for learning our openings. New monographs continue to be published at a steady clip and on increasingly esoteric topics. The Informant series and the New in Chess Yearbooks are locked in a battle for superiority and market-share. Those slightly ahead of the curve subscribe to ChessPublishing.com, which provides monthly theoretical updates in twelve opening sub-fields. But most popular, especially with the younger crowd, are videos. I realized this when a local junior recently ventured the Colorado Counter-Gambit (1.e4 Nc6 2.Nf3 f5?!?) against me in a club game. Not knowing this particular pawn-push – it wasn’t in MCO! – I asked where he’d learned it. The answer, naturally, was an online video. In this essay I’ll review five of the paid video sites in alphabetical order, focusing specifically on their offerings in the opening. Each site has content worthy of your time and money. The goal of this review is to point you in the right direction to begin your studies. Chess.com, along with its sister site chesskid.com, is probably the largest chess website in the world by userbase. While many of its diverse features are free to all users, only Diamond members ($99/yr, $14/mo) can watch videos. The videos consist of a 2D chessboard with voiceover, and they stream in your browser or inside a chess.com mobile app. A few of the videos come with pgns for future study, but none are available for individual purchase or download. There are many IMs and GMs among the chess.com stable of authors, and more than a few have produced video series on their pet systems – Keaton Kiewra on the Dragon, for instance, or Eugene Perelshteyn on the King’s Indian. Fans of Roman Dzindzichashvili will note his prolific output for the site, with many of his videos devoted to diverse topics in the opening. Ben Finegold, currently on the chess.com and chesskid.com staff, is equally busy with opening videos. Searching for specific opening tabiya or series is a bit clunky, as tagging is haphazard, but time poring through the archives is well spent. Sam Shankland’s 2009 series on the Najdorf is worth your attention, and Gregory Kaidanov’s videos on a 1.e4 repertoire for White are great for class players. Chess24 is the newest of the sites under review, and while it remains a work in progress, its early days have been quite promising. 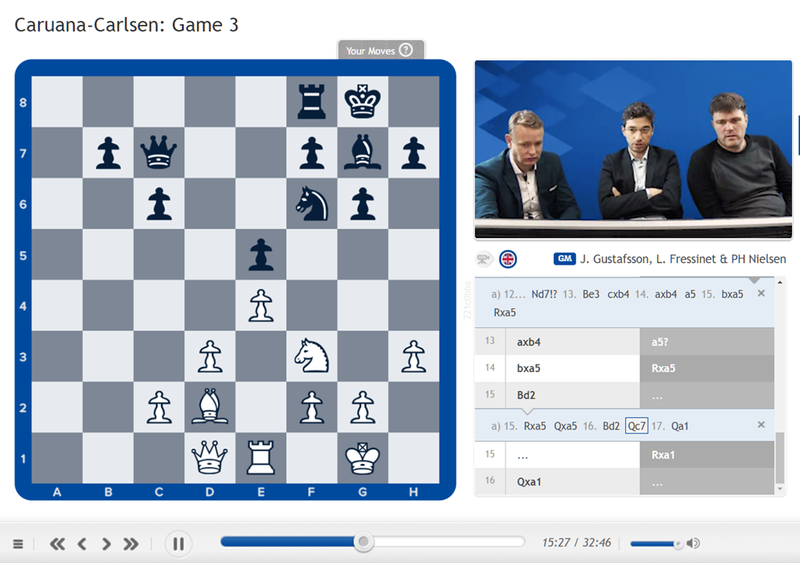 The site is the home for the web coverage of the Tromso Chess Olympiad, and the Norway Chess 2014 event was broadcast there. Chess24 has also lured a number of top players to their studios to produce videos, including two former world champions (Kasimdzhanov and Anand) and multiple 2600+ players. Much of the early advertising for Chess24 featured a video series by Peter Svidler on the Grunfeld, and with good reason: the videos are fantastic. Over the course of 12+ hours, Svidler gives viewers an in-depth look at his approach to the Grunfeld, and he holds nothing back in his analysis. All of White’s tries are covered, and lines against 1.c4 and 1.Nf3 are included. I cannot recommend this series highly enough. Videos stream in your browser, but not in the Chess24 mobile app. The presenter appears to the right of a 2D board, with the moves appearing on the 2D board in synchronicity with her words. The board and pieces are slightly jarring on first glance, but you get used to them quickly enough. Links to an opening database and an analytical engine appear beneath the board, and you can pause the video to try a move on the board and see the engine’s analysis. No pgns are available, but e-books for some videos may appear by the time of the Olympiad. All videos are available to Premium members ($135.99/yr), or they can be purchased individually. Svidler’s series is available for $39.99. Other opening series of note include Jan Gustafsson on building a 1.d4 repertoire ($15.99), Sopiko Guramishvili on the Najdorf ($15.99), and Robin van Kampen on the King’s Indian ($24.99). ChessBase is a behemoth in the world of chess software. They sell ChessBase 12, the database used by most every titled player in the world, along with analytical engines like Houdini and Fritz. ChessBase has turned increasing attention to chess videos, and given their prominence in the chess world, many strong European players record videos for ChessBase when they pass through Hamburg. Videos from ChessBase can only be viewed from within ChessBase, the Fritz/Houdini programs, or the free ChessBase Reader. All are Windows only, leaving non-savvy Linux and Mac users out in the cold. Moves appear on the chessboard in synchronicity with the presenter video, and all of the features of the ChessBase interface are available to the user. You can check a move with your engine of choice while the video runs, and the analysis given in each video is nearly always provided for future study. Most of the ChessBase videos are available to purchase via download. Prices range from €9.90 for the ’60 Minutes’ series of videos to €29.90 for current full-length DVDs. There is value at both ends of the spectrum. Super-GMs like Shirov and van Wely have made engaging videos in the ’60 Minutes’ series on the Winawer and the Najdorf, respectively, and I have given Henrik Danielsen’s video on the London System a positive review on my blog (chessbookreviews.wordpress.com). 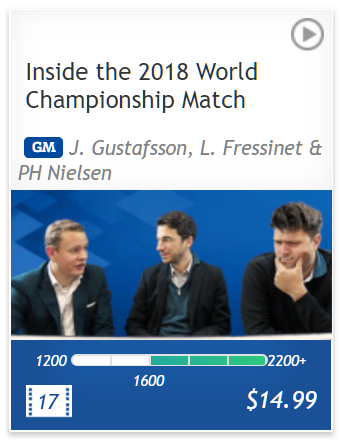 Among full-length DVDs, Peter Heine Nielsen, former assistant to Anand and current Carlsen second, has recorded an impressive two–part series on the Dragon, with some of his analysis reaching into the endgame. I have also found the ‘ChessBase Tutorials’ series on the openings to be quite useful. Between the five DVDs in the series, nearly every major opening system or variation is summarized in about fifteen minutes time, making them handy for your next game against the local Grob fanatic. I’ve been a member of chessclub.com – which I still call by its old name, ICC, or the Internet Chess Club – since it went commercial in 1995, and I still tend to think of it in terms of all-night blitz binges from college. In recent years, however, ICC has put a lot of time and effort into its video offerings, and it now competes on a fairly even playing field with all the other sites discussed in this piece. In ‘Sharpen Your Chess Sense,’ Watson offers viewers opening repertoires specifically designed for club players, and for both colors. Recent series have focused on the Queen’s Gambit, the French, and 1.e4, among others. The videos are a deft mix of ideas and analysis, and players of all temperaments can find something to suit their needs. While ‘Sharpen Your Chess Sense’ is still in production, you’ll have to dig into the archives to find videos on the opening from Ronen Har-Zvi and Boris Alterman. Alterman’s videos focused on opening gambits, and they served as the basis for his two books from Quality Chess on the same subject. Har-Zvi’s videos covered a broad swath of opening lines with his trademark enthusiasm. Non-members are now able to purchase and download many of these videos, with prices usually running about $2.99 per video. Oddly there is no discount when buying a multi-video series. Some videos come with pgns, but the detail contained in the files varies greatly. All videos are viewable in ICC’s app for iOS and in your browser. Chesslecture.com is not the fanciest website around, but what it lacks in polish, it more than makes up for in content. There are 2300+ videos available as I write these words, giving Chesslecture.com one of the deepest archives of material around. Many of the leading video authors have recorded for Chesslecture or do so now. It is currently the exclusive home for two of the best video authors around: Dennis Monokroussos and David Vigorito. The website is mainly text driven, but the search options are plentiful once you learn where to look. You can sort videos by author or broad category on the left side of the screen, and there is a search box at the top right that allows queries by title, keyword, ECO code or author. The indexing and tagging of specific videos leaves something to be desired, but you can generally find what you want without excessive difficulty. There are a lot of gems hidden in the back catalogue. David Vigorito’s videos are consistently excellent. His early series on the Bb5 Sicilian and the Tarrasch Defense remain useful and, generally speaking, theoretically valid. Any of Vigorito’s series, quite frankly, can be recommended without hesitation. Some readers might be looking at all the dollar signs in this review and wondering about free alternatives. They do exist, although – as is always the case with ‘amateur’ content – quality can vary greatly. Let me point out six YouTube users to whom you might want to subscribe. Chessexplained: Christof Sielecki, a German IM, offers his blitz games, tournament recaps, and a number of series on opening repertoires. GregShahadechess: These videos by Greg Shahade usually involve his talking through his thoughts as he plays online games or solves puzzles. Very educational, but the language can get a little rough for sensitive viewers. GJ_Chess: Gunjan Jani is the source for the videos on the Colorado Counter-Gambit mentioned above. What he lacks in playing strength he makes up for in enthusiasm and self-promotion! kingscrusher: Tryfon Gavriel is a prolific producer of video, with 5000+ videos on YouTube. Gavriel analyzes games and talks through his online blitz games. STLChessClub: All lectures from the St Louis Chess Club are recorded and appear here. The lectures are by GMs and IMs who visit the club. Zibbit: Icelandic FM Ingvar Johannesson focuses on game analysis in his videos. This story has been told by Brady in a few forms, the most widely known of which can be found in his classic Bobby Fischer: Profiles of a Prodigy (260). He dates the exchange in a speech in Dallas in November 2011. This entry was posted in Openings, software, video and tagged chess.com, Chess24.com, Chessbase, Chessclub.com, Chesslecture.com, ICC, Internet Chess Club, John Watson, Peter Heine Nielsen, Peter Svidler, Svidler Grunfeld on August 3, 2014 by fullcityplus.